Drew Brees comes knocking – just the ticket (maybe)! Have the New Orleans Saints handed over a brown envelope to the NFL marketing people in London? There are TWO teams coming to London after all. Hooray my tickets arrived this morning for the San Diego Chargers v New Orleans Saints game at Wembley Stadium, now just two weeks away. 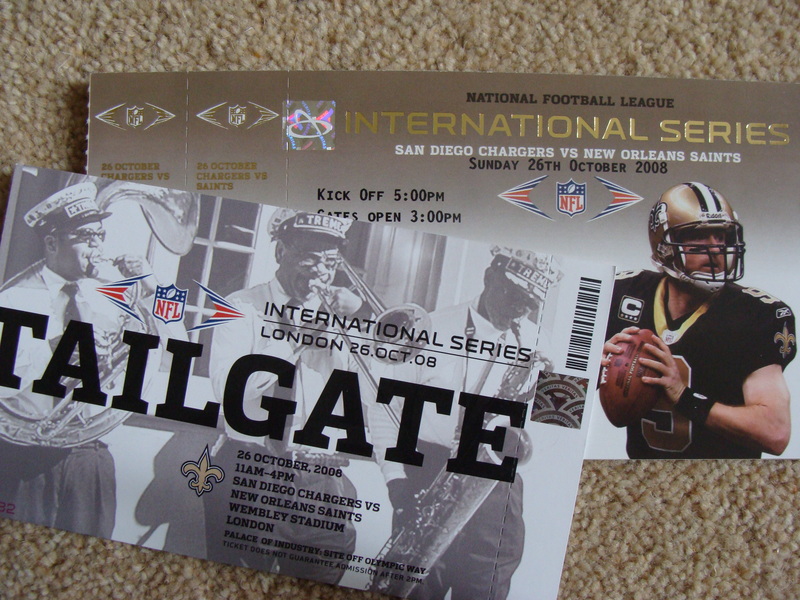 have to admit the tickets for the 2008 NFL International Game are a vast improvement on the 2007 ones as the four game tickets I secured have a picture of Saints quarterback Drew Brees on them, a sweet embossed gold headline text and a faded background that looks neat. 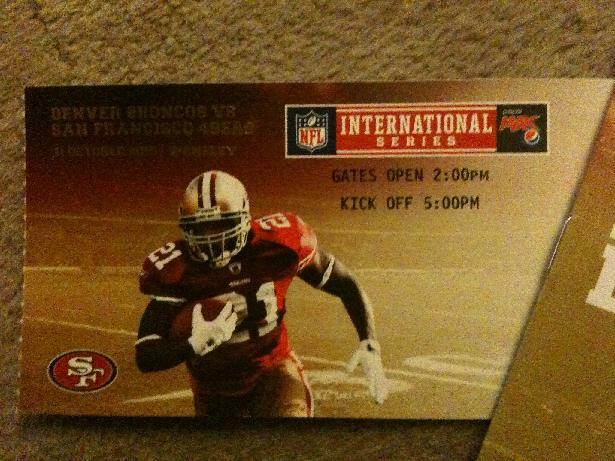 I do wonder if other people get tickets with a Chargers player on them ? If not it seems a bit unfair to just have one team represented on the tickets. The taligate tickets are also pretty cool – but again there is a Cajun feel, with a Saints logo on the ticket and some authentic New Orleans jazz musicians in a faded black and white photo background. I do think the design is a Lambeau Leap above last years effort but if I am a San Diego Charger I am not exactly delighted. It takes two teams to tango and I do like the retro Chargers uniform with the white helmets and powder blue shirts, it does seem that NFL marketing officials are not fans of the Chargers kit or brand. One final comment for all those NFL marketing people – included in with my game tickets and tailgate tickets was a promotional flier for the purchase of NFL merchandise. Thankfully it had BOTH the Saints (Marques Coltson wideout) and Chargers (Chris Chambers wideout) represented. There was a problem though as the image of Chambers is reversed – so his shirt number and chargers name read RIGHT to LEFT. It’s only one game a year guys – get it right ! Anyone else have any ticket observations ?